Monohydrocalcite: Mineral information, data and localities. 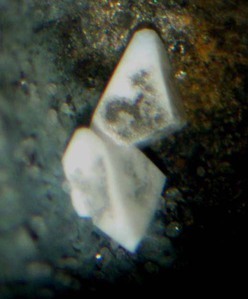 Named in 1964 by Evgeny Ivanovich Semenov for the chemical relation to calcite and because it contains one ('mono') water molecule ('hydro'). 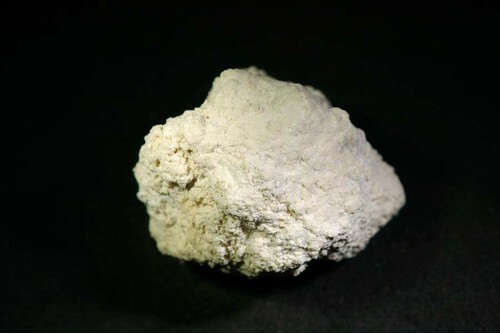 Compare Unnamed (Amorphous Calcium Carbonate). Note: In syntheses, a metastable precursor phase with the formula Ca(CO3).0.5H2O was found that later transforms into monohydrocalcite (Zou et al., 2019). Subcell (space group P3121): 6.0931, 7.5446 A.
Semenov, E.I. (1964) Hydrated carbonates of sodium and calcium. Translated from. Kristallografiya: 9: 109-110. Callaghanite 2 photos of Monohydrocalcite associated with Callaghanite on mindat.org. Rauenthalite 1 photo of Monohydrocalcite associated with Rauenthalite on mindat.org. Lanarkite 1 photo of Monohydrocalcite associated with Lanarkite on mindat.org. 5.CB.25 Ikaite CaCO3 · 6H2O Mon. 5.CB.45 Baylissite K2Mg(CO3)2 · 4H2O Mon. 5.CB.50 Tuliokite Na6BaTh(CO3)6 · 6H2O Trig. 11.4.5 Ikaite CaCO3 · 6H2O Mon. Baron, G. and Pesneau, M. (1946) Sur l'existence et un mode de preparation du monohydrate de carbonate de calcium. Comptes Rendus: 243: 17. Brooks, R., Clark, L.M., Thurston, E.F. (1950) Calcium carbonate and its hydrates. Philosophical Transactions of the Royal Society of London. Series A Mathematical and Physical Sciences 243: 145-167. Fleischer, M. (1964) New mineral names. American Mineralogist: 49: 1151-1154. Marschner, Hannelore (1969) Hydrocalcite (CaCO3·H2O) and nesquehonite (MgCO3·H2O) in carbonate scales. Science: 165: l119-ll2l. Broughton, P.I. (1972) Monohydrocalcite in speleothems: an alternative interpretation. Contributions to Mineralogy and Petrology: 36: 171-174. Hull, H., Turnbull, A.G. (1973) A thermochemical study of monohydrocalcite. Geochimica et Cosmochimica Acta: 37(3): 685-694. Stoffers, P., Fischbeck, R. (1974) Monohydrocalcite in the sediments of Lake Kivu (East Africa). Sedimentology: 21: 163-171. Taylor, G.F. (1975) The occurrence of monohydrocalcite in two small lakes in the South East of South Australia. American Mineralogist: 60: 690-697. Effenberger, H. (1980) The crystal structure of calcium carbonate monohydrate, CaCO3•H2O. 6th European Crystallographic Meeting, Barcelona, Spain. Effenberger, H. (1981) Kristallstruktur und Infrarot-Absorptionsspektrum von synthetischen Monohydrocalcit, CaCO3(H2O). Monatschefte fur Chemie und verwandte Teile anderer Wissenschaften: 112: 899-909. Řidkošil T, Sejkora J, Ondruš P. (1991) Monohydrocalcite from polymetallic vein of the Vrančice deposit, near Příbram. Czechoslovakia. Neues Jahrbuch für Mineralogie - Monatshefte: 7: 289–295. European Journal of Mineralogy (1994): 6: 256. 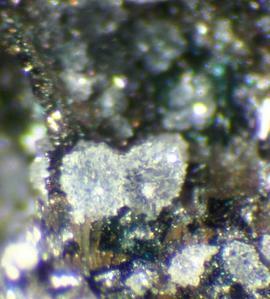 American Mineralogist (1995): 80: 634. Garvie, L.A.J. (2003) Decay-induced biomineralization of the saguaro cactus (Carnegiea gigantea). American Mineralogist: 88: 1879-1888. Dahl, K. and B. Buchardt (2006) Monohydrocalcite in the arctic Ikka Fjord, SW Greenland. Journal of Sedimentary Research: 76: 460-471. Brečević, Ljerka and Kralj, Damir (2007) On Calcium Carbonates: from Fundamental Research to Application. Croatica Chemica Acta: 80(3-4): 467-484. Swainson, I.P. (2008) The structure of monohydrocalcite and the phase composition of the beachrock deposits of Lake Butler and Lake Fellmongery, South Australia. American Mineralogist: 93: 1014-1018. Wang, Y.Y., Yao, Q.Z., Zhou, G.T., Fu, S.Q. (2015) Transformation of amorphous calcium carbonate into monohydrocalcite in aqueous solution: a biomimetic mineralization study. European Journal of Mineralogy: 27: 717-729. 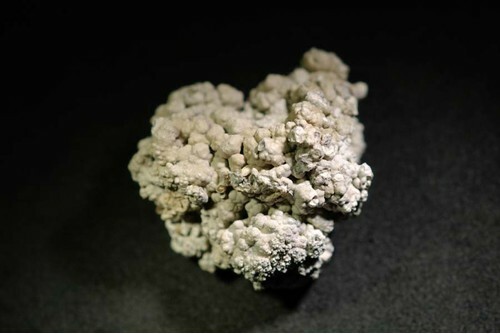 Tomáš, Mikuš; Martin, Patúš; Jarmila, Luptáková; Tomáš, Bancík; Adrián, Biroň (2017) Mineralogical characteristics of the secondary calcium carbonates association from the Špania Dolina - The first occurrence of monohydrocalcite in ore deposits in Slovakia. Bulletin Mineralogie Petrologie: 25(2): 318-326. Makovicky, E. (2018) The order–disorder potential of the crystal structure of monohydrocalcite, CaCO3·H2O. Mineralogy and Petrology: 112: 105-109. Zhaoyong Zou, Wouter J. E. M. Habraken, Galina Matveeva, Anders C. S. Jensen, Luca Bertinetti, Matthew A. Hood, Chang-yu Sun, Pupa U. P. A. Gilbert, Iryna Polishchuk, Boaz Pokroy, Julia Mahamid, Yael Politi, Steve Weiner, Peter Werner, Sebastian Bette, Robert Dinnebier, Ute Kolb, Emil Zolotoyabko, Peter Fratzl (2019): A hydrated crystalline calcium carbonate phase: Calcium carbonate hemihydrate. Science 363, 396-400. Last, F. M., Last, W. M., Fayek, M., & Halden, N. M. (2013). Occurrence and significance of a cold-water carbonate pseudomorph in microbialites from a saline lake. Journal of paleolimnology, 50(4), 505-517. Minghui Li, Shichang Kang, Liping Zhu, Qinglong You, Qianggong Zhang, and Junbo Wang (2008): Quaternary International 187, 105-116. Fischbeck, R. & Müller, G. (1971): Monohydrocalcite, hydromagnesite, nesquehonite, dolomite, aragonite, and calcite in speleothems of the Fränkische Schweiz, Western Germany. Contributions to Mineralogy and Petrology 33, 87-92; Broughton, P. L. (1971): Monohydrocalcite in speleothems: An alternative interpretation Contributions to Mineralogy and Petrology 36, 171-174. Ito (1993) Ganseki-Koubutsu-Koshogaku Zasshi, 88, 485-491. Mikuš T., Patúš M., Luptáková J., Bancík T., Biroň A. (2017): Mineralogická charakteristika asociácie sekundárnych karbonátov vápnika zo Španej Doliny - prvý nález monohydrokalcitu z rudných ložísk na území Slovenska. Bull. Mineral. Petrolog., 25, 2, 318-326 (in Slovak with English abstract). Mikuš T., Patúš M., Luptáková J., Bancík T., Biroň A., 2017: Mineralogická charakteristika asociácie sekundárnych karbonátov vápnika zo Španej Doliny - prvý nález monohydrokalcitu z rudných ložísk na území Slovenska. Bull. Mineral. Petrolog., 25, 2, 318-326 (in Slovak with English abstract). Onac, B.P., Fornós, J.J., Ginés, A., Ginés, J. (2005): Mineralogical reconnaissance of caves from Mallorca Island. Endins, 27, 131-140. Stalder, H. A., Wagner, A., Graeser, S. and Stuker, P. (1998): "Mineralienlexikon der Schweiz", Wepf (Basel), p. 281. Garvie, L.A.J. (2003) Decay-induced biomineralization of the saguaro cactus (Carnegiea gigantean). American Mineralogist: 88: 1879-1888. Grant, Raymond W., Bideaux, R.A., and Williams, S.A. (2006) Minerals Added to the Arizona List 1995-2005: 6. Dunn, P.J. : Min.Rec. :10:160-165 (1979); Jenkins, R.E., II: The Picking Table:35(1):16-24 (1994); Dunn(1995):Pt4:622-623.